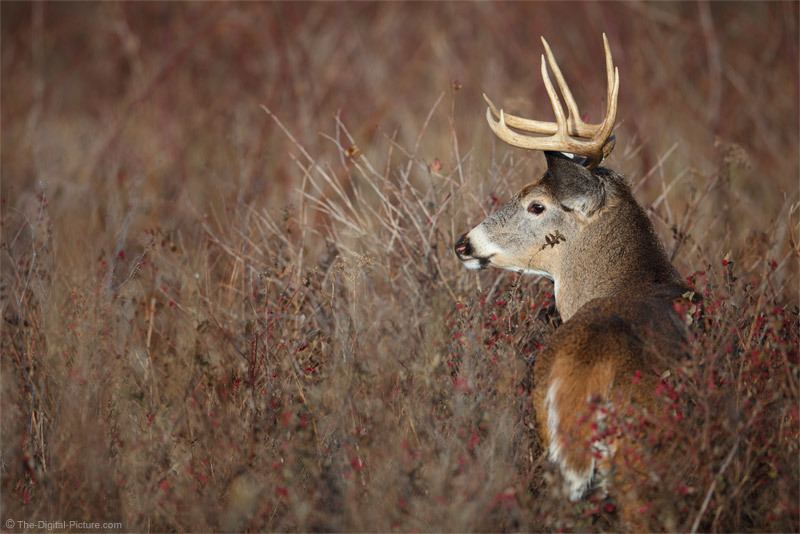 I shared this white-tailed buck image in the LensCoat RainCoat Review and decided I would share it individually as well. This deer encounter was mid-afternoon on a mid-fall day in Shenandoah National Park. The time of the day combined with the time of the year meant a relatively low sun angle and the time of the year also meant that the buck was in rut. This nice-sized buck was with a doe and he was making sure that rivals did not intrude and was constantly watching for such. The constantly watching aspect is a key point. During non-rut times, it can be hard to get a buck to lift its head in this national park, but during rut, that problem vanishes. The buck are constantly giving their best alert poses. And, when a challenger shows up, the action gets especially entertaining. Many basic image composition strategies involve establishing balance in the frame. When an included subject has eyes, the direction they are looking adds weight to the side of the frame being peered toward. This means the subject, adding weight itself, should be moved toward the opposite side of the frame for equalization. There is some flexibility as to how far to move the subject and the rule of thirds often has value in this situation. Had this buck simply turned his head the other direction, I would have had to rapidly change AF points to the other side of the frame and recompose to move the majority of empty space to the right side of the animal to again achieve the desired balance. As an aside, if that head turn happens, quickly grab a photo placing the already-selected AF point on the closest eye. Then switch AF points as desired prior to continuing to photograph. I often do this because moments with wildlife can be fleeting and as long as you have the entire animal/bird in the frame and in focus, you still have the option to photograph additional empty space after the animal is vanishes. The photo of empty space probably will not be very special (don't accidentally delete it later), but it can be perfect for stitching into the fast-captured wildlife image. In this case, the buck was motionless for a long enough period of time for me to capture a dozen or so images. All seemed ideally-composed in the viewfinder, most were composed slightly differently and many variants still looked potentially the best during review on the computer. That of course meant that picking only one of them to share was a challenge. Some of you remember that I often use the Canon EF 200-400mm f/4L IS USM Lens at SNP. The zoom is ideal for working around obstructions, but this time I opted to use the Canon EF 600mm f/4L IS II USM Lens. I made this choice primarily to get the stronger background blur (and foreground blur in this case). I know, you are thinking that this is a big and expensive lens. But, it is among my most-frequently-used and a large percentage of my favorite images were captured with it. One editing question regarding this image remains in my mind: should I remove the small branch over the deer's head? Or does that detail add to the image, emphasizing of the thickness of the brush he is in?